The dials which display in your Engagement Overview are what is been used to calculate your engagement score. Your Administrator has determined what Zunos activities are used to calculate your engagement score. 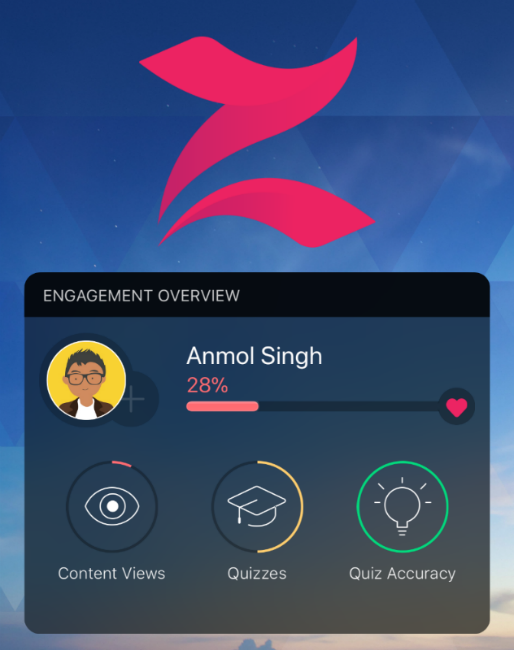 An example Engagement Overview can be used for reference: Where Content Views and Quizzes display your overall score and indicate which areas require attention. Look below for a listing of the Engagement measures available. Content views - Tap to see updated content. New files will always be indicated by a number besides the folder. For content to count towards the engagement Overview score it needs to be enabled by following the steps our Enable engagement dashboard view article. Courses - Progress continues as you work your way through a course by viewing content and completing quizzes etc. Tapping on the icon will take you to the list of Courses in your To Do list. Achievements - The engagement score will increase as you complete available achievements assigned to you by your administrator. Tapping on the icon will take you to see all your Achievements.